by Chris Woodford. Last updated: October 10, 2018. There's plenty of it, it's relatively cheap (or even free), it's environmentally friendly, it looks great, it's warm and cozy, it's super-strong, it lasts hundreds or even thousands of years, and you can use it for everything from building bridges to making paper or heating your home. It's wood—and it's quite possibly the most useful and versatile material on the planet, with many thousands of different uses. So what is it that makes wood so good? Let's take a closer look! Photo: Wood really does grow on—or rather in—trees. Who'd have thought you could make a lovely coffee table or a fruit bowl from a gnarled old specimen like this? The outer part of a tree trunk might look dead, but it's very much alive: tree trunks grow outward (getting wider) as well as upward (getting higher). You often hear people grumbling about money and all kinds of other things that "don't grow on trees"; the great thing about wood is that it does grow on trees—or, more specifically, in their trunks and branches. 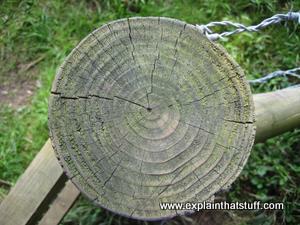 Photo: This fence pole was once a tree—and you can still clearly see the annual growth rings if you look down on it from above. 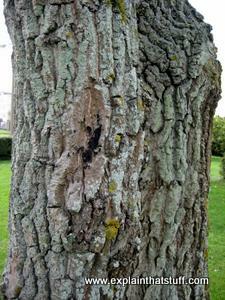 Take a tree and peel off the outer "skin" or bark and what you'll find is two kinds of wood. Closest to the edge there's a moist, light, living layer called sapwood packed with tubes called xylem that help a tree pipe water and nutrients up from its roots to its leaves; inside the sapwood there's a much darker, harder, part of the tree called the heartwood, which is dead, where the xylem tubes have blocked up with resins or gums and stopped working. Around the outer edge of the sapwood (and the trunk) is a thin active layer called the cambium where the tree is actually growing outward by a little bit each year, forming those famous annual rings that tell us how old a tree is. Slice horizontally through a tree, running the saw parallel to the ground (perpendicular to the trunk), and you'll see the annual rings (one new one added each year) making up the cross-section. Cut vertically through a tree trunk and you'll see lines inside running parallel to the trunk formed by the xylem tubes, forming the inner structure of the wood known as its grain. You'll also see occasional wonky ovals interrupting the grain called knots, which are the places where the branches grew out from the trunk of a tree. Knots can make wood look attractive, but they can also weaken its structure. Hardwoods typically come from broad-leaved (deciduous) trees (those that drop their leaves each fall, also known as angiosperms because their seeds are encased in fruits or pods). Examples include ash, beech, birch, mahogany, maple, oak, teak, and walnut. Softwoods typically come from evergeen (coniferous) trees (those that have needles and cones and retain them year-round, also called gymnosperms. Examples include cedar, cypress, fir, pine, spruce, and redwood. 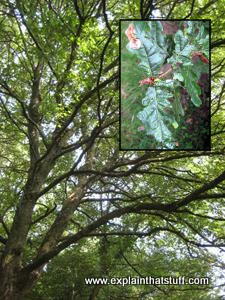 Photo: Left/above: Hardwood comes from deciduous trees like this oak. Its leaves (inset) drop off in the fall and new ones grow in spring. 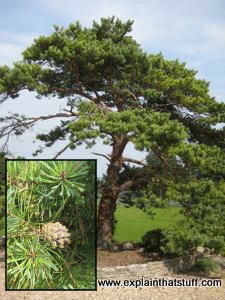 Photo: Right/below: Softwood comes from evergreen conifers, like this pine, which has needles that stay on all year and cones (inset). It's generally true that hardwoods are harder than softwoods, but not always. Balsa is the best-known example of a hardwood that is actually very soft. Hardwoods have lovely, attractive grains and are used for such things as making fine furniture and decorative woodwork, whereas softwoods often come from very tall, straight trees, and are better suited for construction work (in the form of planks, poles, and so on). Look at some freshly cut wood under a microscope and you'll see it's made up of cells, like any other plant. The cells are made of three substances called cellulose (about 50 percent), lignin (which makes up a fifth to a quarter of hardwoods but a quarter to a third of softwoods), and hemicellulose (the remainder). Broadly speaking, cellulose is the fibrous bulk of a tree, while lignin is the adhesive that holds the fibers together. The inner structure of a tree makes wood what it is—what it looks like, how it behaves, and what we can use it for. There are actually hundreds of different species of trees, so making generalizations about something called "wood" isn't always that helpful: balsa wood is different from oak, which isn't quite the same as hazel, which is different again from walnut. Having said that, different types of wood have more in common with one another than with, say, metals, ceramics, and plastics. Physically, wood is strong and stiff but, compared to a material like steel, it's also light and flexible. It has another interesting property too. Metals, plastics, and ceramics tend to have a fairly uniform inner structure and that makes them isotropic: they behave exactly the same way in all directions. Wood is different due to its annual-ring-and-grain structure. You can usually bend and snap a small, dead, tree branch with your bare hands, but you'll find it almost impossible to stretch or compress the same branch if you try pulling or pushing it in the opposite direction. The same holds when you're cutting wood. If you've ever chopped wood with an ax, you'll know it splits really easily if you slice with the blade along the grain, but it's much harder to chop the opposite way (through the grain). We say wood is anisotropic, which means a lump of wood has different properties in different directions. 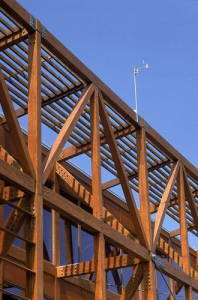 Photo: Wood is a traditional building material, as popular today as ever. Because wood is anisotropic, natural wooden beams work better as vertical posts (where they are in compression) than horizontal beams (where they are in tension). That's not a problem here, because these beams are laminated so they are equally strong in all directions. The diagonal members add further strength to stop the horizontal beams from bending. Photo by Robb Williamson courtesy of US DOE/NREL (Department of Energy/National Renewable Energy Laboratory). Read more about how buildings work. That's not just important to someone chopping away in the woodshed: it also matters when you're using wood in construction. Traditional wooden buildings are supported by huge vertical poles that transmit forces down into the ground along their length, parallel to the grain. That's a good way to use wood because it generally has high compressive strength (resistance to squeezing) when you load it in the same direction as the grain. Wooden poles are much weaker placed horizontally; they need plenty of support to stop them bending and snapping. That's because they have lower tensile strength (resistance to bending or pulling forces across the grain). Not all woods are the same, however. Oak has much higher tensile strength than many other woods, which is why it was traditionally used to make the heavy, horizontal beams in old buildings. 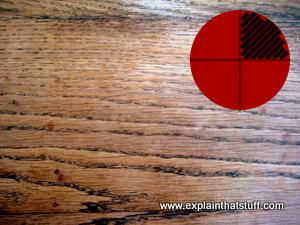 Other factors such as how well seasoned (dry) a piece of wood is (as discussed below) and how dense it is also affect its strength. Chart: Wood can be very weak. In tension (for example, stretched horizontally in struts or beams), it's one of the weakest of all common materials. That's why it's more likely to be used in compression (in vertical beams), where it's very much stronger. (Concrete suffers from the same problem, which it's why it's often reinforced with steel.) All woods are different, and vary with atmospheric conditions, but typically they're 10–30 times stronger in the longitudinal direction than in the radial direction (see the inset picture of a tree trunk for an explanation of these terms). One of the best things about wood is how long it lasts. Browsing through the daily news, you'll often read that archeologists have unearthed the buried remains of some ancient wooden article—a wooden tool, perhaps, or a simple rowboat or the remnants of a huge building—that are hundreds or even thousands of years old. Providing a wooden object is properly preserved (something else we discuss later), it will easily outlast the person who made it. But just like that person, a wooden object was once a living thing—and it's a natural material. Like other natural materials, it's subject to the natural forces of decay through a process known as rotting, in which organisms such as fungi and insects such as termites and beetles gradually nibble away the cellulose and lignin and reduce wood to dust and memories. Photo: Under attack! The big problem with wood is that it's a natural material subject to attack from other natural things, notably fungi and insects. 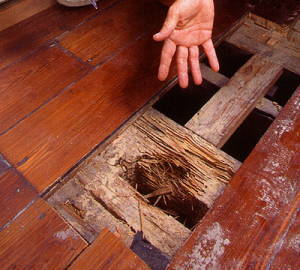 This is what Formosan subterranean termites can do to wood. Photo by Scott Bauer courtesy of US Department of Agriculture/Agricultural Research Service. Wood has many other interesting characteristics. It's hygroscopic, which means that, just like a sponge, it absorbs water and swells up in damp conditions, giving out the water again when the air dries and the temperature rises. If, like mine, your home has wooden windows, you'll probably notice that they open much more easily in summer than in winter, when the damp outdoor conditions make them swell into the frames (not necessarily such a bad thing, since it helps to keep out the cold). Why does wood absorb water? Remember that the trunk of a tree is designed to carry water from the roots to the leaves: it's pretty much a water superhighway. A freshly cut piece of "green" wood typically contains a huge amount of hidden water, making it very difficult to burn as firewood without a great deal of smoking and spitting. Some kinds of wood can soak up several times their own weight of water, which is absorbed inside the wood by the very same structures that transported water from the roots of the tree to the leaves when the tree was a living, growing plant. What other properties does wood have? It's a relatively good heat insulator (which comes in handy in building construction), but dry wood does burn quite easily and produces a great deal of heat energy if you heat it up beyond its ignition temperature (the point at which it catches fire, anywhere from around 200–400°C, 400–750°F). Although wood can absorb sound very effectively (another useful property in buildings, where people value sound insulation shutting out their neighbors), wooden objects can also be designed to transmit and amplify sounds—that's how musical instruments work. Wood is generally a poor conductor of electricity but, interestingly, it's piezoelectric (an electric charge will build up on wood if you squeeze it the right way). Wood was one of the first natural materials people learned to use, and it's never lost its popularity. These days, it's particularly prized for being a natural and environmentally friendly product. Forestry is a rare example of something that has the potential to be completely sustainable: in theory, if you plant a new tree for every old tree you cut down, you can go on using wood forever without damaging the planet. In practice, you need to replace like with like and forestry is not automatically sustainable, whatever papermakers like us to believe. A brand new tree has much less ecological value than a mature tree that's hundreds of years old so planting a thousand saplings may be no replacement for felling just a handful of ancient trees. 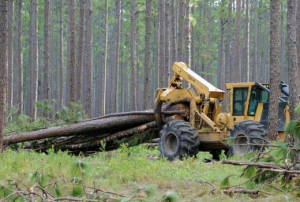 Logging can be hugely environmentally damaging, whether it involves clearcutting a tropical rainforest or selectively felling mature trees in old-growth temperate woodland. Some of the processes and chemicals used in forestry and woodworking are also environmentally damaging; chlorine, used to bleach wood fibers to make paper, can cause water pollution in rivers, for example. But on the positive side, growing trees remove carbon dioxide from the atmosphere and planting more of them is one way to reduce the effects of climate change. Trees also provide important habitats for many other species and help to increase biodiversity (the wide range of living organisms on Earth). 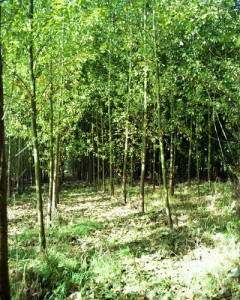 Practiced the right way, forestry is a good example of how people can live in perfect harmony with the planet. How does wood get from the tree to the roof of your house, your bookshelf, or the chair you're sitting on? It's a longer and more complex journey than you might think that takes in harvesting, seasoning, preserving and other treatment, and cutting. Here's a brief guide. Photo: Chopping down a longleaf pine is only the start of the fun: now you've got to get it home preferably without damaging the rest of the forest in the process. That's where this skidder machine comes in, lifting up the logs with a hydraulic crane and dragging them away with a powerful diesel engine. Photo by Randy C. Murray courtesy of US Army. Growing plants for food is called agriculture; growing trees for human use is silviculture—and the two things have a great deal in common. Wood is a plant crop that must be harvested just like any other, but the difference is how long trees take to grow, often many years or even decades. How wood is harvested depends on whether trees are growing in plantations (where there are hundreds or thousands of the same species, generally of similar age) or in mature forests (where there's a mixture of different species and trees of widely differing ages). Planted trees may be grown according to a precise plan and clear-cut (the entire forest is felled) when they reach maturity. A drastic approach like that makes sense if the trees are a fast-growing species planted specifically for use as biomass fuel, for example. Individual trees can also be selectively felled from mixed forests and either dragged away by machine or animal or even (if it makes economic and environmental sense) hauled upward by helicopter, which avoids damaging other nearby trees. Sometimes trees have their bark and small branches removed in the forest before being hauled away to a lumber yard for further processing, though they can also be removed intact, with the entire processing done offsite. It all depends on the value of the tree, the growing conditions, how far away the lumber yard is, and how easy the tree is to transport. Another interesting form of forestry is called coppicing, which involves removing long, thin, low-growing branches from trees such as hazel and willow in a careful and respectful way that does no long-term damage. Photo: These cottonwood trees might look too spindly for making poles or planks, but they'll not be used for either. They're part of a fast-growing plantation that produces biomass, a type of renewable energy burned in power plants. Biomass is better for the environment because the trees take in as much carbon dioxide when they grow as they give out when they're burned; leaving aside the energy wasted in harvesting and processing, a biomass plant produces no overall carbon dioxide emissions, unlike a traditional power plant fueled by oil or coal. Other "energy crops" include willow, poplar, and eucalyptus. Photo by Warren Gretz courtesy of US DOE/NREL (Department of Energy/National Renewable Energy Laboratory). A freshly cut tree is a bit like a sponge that comes presoaked in water, so it has to be completely dried out or seasoned before it can be used. Dry wood is less likely to rot and decay, it's easier to treat with preservatives and paint, and it's much lighter and easier to transport (typically, half a freshly felled tree's weight may come from water trapped inside). Dry wood is also much stronger and easier to build with (it won't shrink so much) and if a tree is destined for burning as firewood (or an energy crop), it will burn more easily and give out more heat if it's properly dried first. Typically wood is dried either in the open air (which takes anything from a few months to a year) or, if speed is important, in vast heated ovens called kilns (which cuts the drying time to days or weeks). Seasoned wood is still not completely dry: typically its moisture content varies from about 5–20 percent, depending on the drying method and time. In theory, wood might last forever if it weren't attacked by bugs and bacteria; preservatives can greatly extend its life by preventing rot. Different preservatives work in different ways. Paint, for example, works like an outer skin that stops fungi and insects penetrating the wood and eating it away, but sunlight and rain make paint crack and flake away, leaving the wood open to attack underneath. Creosote (another popular wood preservative) is a strong-smelling, oily brown liquid usually made from coal-tar. Unlike paint, it is a fungicide, insecticide, miticide, and sporicide: in other words, it works by stopping fungi, insects, mites, and spores from eating or growing in the wood. 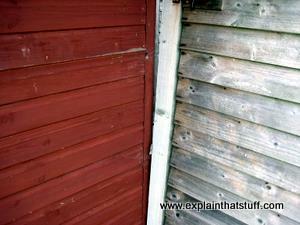 Photo: A fence before (right) and after (left) treatment with wood preservative. Different kinds of treatment help to protect and preserve wood in other ways. It's a great irony that wood can be used to build a fine home that will last many decades or burn to the ground in minutes. Wood is so plentiful and burns so well that it has long been one of the world's favorite fuels. That's why fire-protection treatment of wooden building products is so important. Typically, wood is treated with fire retardant chemicals that affect the way it burns if it catches fire, reducing the volatile gases that are given off so it burns more slowly and with greater difficulty. There's a big difference between a tree and the table it might become, even though both are made from exactly the same wood. That difference comes mainly from skillful cutting and woodworking. How much cutting a tree needs depends on the product that's being made. Something like a utility pole or a fence post is not much more than a tree stripped of its branches and heavily treated with preservatives; that's an example of what's called roundwood. Trees need a bit more work in the sawmill to turn them into lumber, timber, or sawnwood (the three names are often used interchangeably, though they can be used with more specific meanings). Flat pieces of wood can be made from trees by cutting logs in two different directions. If you cut planks with the saw running in lines parallel to the length of the trunk, you get plainsawn (sometimes called flatsawn) wood (with ovals or curves on the biggest flat surface of the wood); if you fell a tree, cut the trunk into quarters, then slice each quarter into parallel planks, you get quartersawn wood (with the grain running along the biggest flat surface in broadly parallel stripes). Photo: Left/above: Plainsawn wood is parallel to the trunk, revealing the annual rings as curves or ovals. 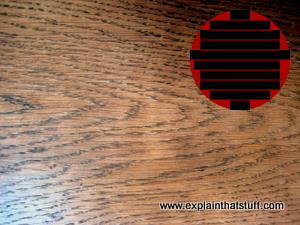 Right/below: Quartersawn wood is first quartered and then sawn, revealing a pattern of roughly parallel lines. See how attractive those patterns look? Not surprisingly, wood that's destined for furniture and other decorative uses has to be cut much more thoughtfully and carefully with regard to what's called its figure. This is the way a particular tree is cut to show off the growth patterns it contains in the most attractive way in the final piece of wood. The figure can also depend on which part of a tree is used. Wood cut from near the stump of a tree will sometimes produce a more attractive figure than wood cut from higher up. Photo: Particle board is made from offcuts of wood stuck together and coated with an attractive veneer or other surface layer (perhaps plastic or a laminate). This is what an Ikea Billy bookcase looks like if you peer round the back. You can see the veneer on the extreme left and a hardwood backing on the right. Roundwood and sawnwood are what you might call natural wood products, because they involve using cut pieces of tree more or less in raw form. There are many other ways of using trees that involve greater amounts of processing. Some woods are very rare and expensive, while others are cheap and plentiful, so a common technique is to apply an outer layer of expensive and attractive wood to a core of cheaper material. Veneer is a thin decorative layer applied to cheaper wood made by turning a log against a blade, much like peeling an apple. Using veneer means you can get an attractive wooden finish at much lower cost than by using a solid piece of expensive wood. Plywood is made by taking layers of wood (or plies) and gluing them together with an outer coating of veneer. Typically each ply is placed at 90 degrees to the one underneath so the grains alternate. That means a piece of plywood is usually much stronger than a piece of the natural wood from which it's made. Laminated wood is a weaker kind of plywood in which the grain of each layer runs in the same direction. Particle board (often called chipboard) is made by taking the waste chips, flakes, and sawdust from a mill and forcing it under high pressure, with glue, in a mold so it sticks together to make planks and panels. Low-cost and self-assembly furniture is often made this way. Fiber-board is similar, but made with wood-pulp fibers instead of wood chips and sawdust. 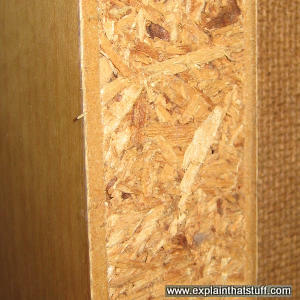 Hardboard is a thin sheet of wood made from wood fibers in much the same way. Not all wood products are immediately recognizable as such. A great deal of the paper and cardboard people use is made by turning cellulose from trees into a fibrous pulp, for example. Lignin (the other main chemical inside wood) also has many uses, including making plastics (such as the celluloid used in old-fashioned photographic film), paints, turpentine, and yeast products. The Hidden Life of Trees by Peter Wohlleben and Tim Fridtjof Flannery. Read How You Want, 2016. Do trees form a social network? A forester's intriguing thesis about the hidden world of woodland. Trees: A Lifetime's Journey Through Forests, Woods and Gardens by Hugh Johnson. University of California Press, 2010. Meetings with remarkable trees by Thomas Pakenham. Weidenfeld, 2003. Available in various editions published since the mid-1990s. Wonderful photos and accompanying text celebrating truly remarkable examples of different tree species. Wood by Andy Goldsworthy. Thames & Hudson, 2010. An appreciation of wood from one of our leading "nature-sculptors." The Secret Life of Trees: How They Live and Why They Matter by Colin Tudge. Penguin, 2006. A very readable introduction to the science and ecological importance of trees, with a look at why trees are so different around the world. The Encyclopedia of Wood by U.S. Department of Agriculture. Skyhorse, 2007. A detailed technical reference for people architects, builders, and others who use wood in construction. Understanding Wood: A Craftsman's Guide to Wood Technology by R. Bruce Hoadley. Taunton, 2000. An in-depth, practical guide to woodworking. The New Science of Strong Materials (or Why You Don't Fall Through the Floor) by J.E. Gordon. Penguin, 1991. Chapter 7 "Timber and cellulose" is a great introduction to how wood's properties are determined by the inner stucture of trees and their growth. The Wonder of Trees by Nicola Davies and Lorna Scobie. Hodder, 2019. A wide-ranging, 64-page, illustrated celebration of trees, including a closer look at the structure of a tree, ecosystems based on trees, and environmental issues such as deforestation. Ages 9–11. DK Eyewitness: Tree by David Burnie. Dorling Kindersley, 2015. A lavish, 72-page photographic guide that follows the basic science of how trees grow from seeds to saplings, how they're affected by things like pollution, and how to recognize a few of the more common species. Ages 9–12. Wood by Steve Parker. Gareth Stevens, 2001. This book has more of an emphasis on wood as a material. Topics covered include where wood comes from and why it's important in everyday life. Ages 9–12. Tracking timber: could new technology help clean up the supply chain? by Will Henley. The Guardian, 14 August 2013. Monitoring the origin of timber using techniques such as DNA testing offers a practical way of protecting forests. Recycled wood: the truly green key to a sustainable built environment by Leon Kaye. The Guardian, 24 July 2012. Using reclaimed timber saves forests and keeps waste out of landfills. Building With Whole Trees by Anne Raver. The New York Times, November 4, 2009. Architects are exploring the advantages of building with more or less intact trees (instead of ones stripped down into anonymous planks and beams). Evaluating the Environmental Performance of Wood Building Materials by Jason Guiles. State University of New York College of Environmental Science and Forestry. A short but very informative summary of how wood compares to steel, concrete, and other heavy-duty building materials.